Readers' Choice 2018: Charitable Organization – J. The San Francisco-based Jewish Family and Children’s Services — which also serves the North Bay and the Peninsula — provides compassionate care to children, families and older adults facing transitions and personal crises. Its 40-plus programs and services include adoption help, LGBTQ support, senior and end-of-life counseling, and assistance to émigrés, Holocaust survivors, people with disabilities and families in crisis. Hebrew Free Loan, launched in 1897 to help new immigrants, provides interest-free loans to adopting couples, first-time homebuyers, families facing emergencies, students and small business owners; 99.5 percent of these loans have been repaid. In addition to serving the Jewish community, the agency offers loans, on a nonsectarian basis, to college students from low-income families. 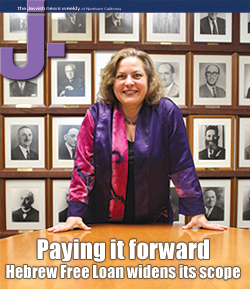 Created as a task force in 1992, in 2000 Shalom Bayit became Northern California’s first and only Jewish agency dedicated to eradicating domestic violence. It provides counseling and support for Jewish women in abusive and controlling relationships. Based in Oakland with offices on the Peninsula, the agency serves the entire region and provides abuse-prevention and healthy-relationship workshops. Located in Palo Alto, Friendship Circle embraces children with special needs of all levels, involving them in a full range of social and educational experiences in a Jewish environment. Programs for children and families run year-round. Teen volunteers help with the children in addition to staff. Chabad Jewish Center of Novato provides “Constant Caring,” a humanitarian program that gives immediate emergency support — food, clothing shelter, medication and the like — to local individuals of all religious and racial backgrounds.